The winner of the 2014 CIS Excellence Special Award has gone on to scoop the Catey Award for Education and Training Award. Willie McCurrach, Curriculum Head for Food at City of Glasgow College, follows in the footsteps of Jamie Oliver and Gordon Ramsay by winning the award at the ceremony in London earlier this month. 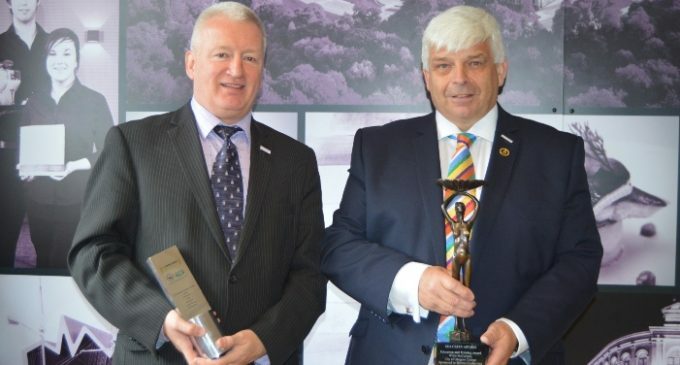 The judges awarded the accolade to Willie (pictured right, with colleague Gordon McIntyre) in recognition of his near four decades working in Scotland’s catering industry. He said: ‘I was shortlisted for the award last year so I was absolutely elated when the result came through this year for a second time. The Education and Training Award has never been given to a college lecturer in Scotland, so it’s a huge honour to have won it and I still can’t quite believe it. Willie’s success comes just weeks after his colleague, Gordon McIntyre, was named Hospitality Educator of the Year at the 2016 CIS Excellence Awards.